There is no other place for you to consider for your next deposition other than the Spectrum Center. This prestigious deposition location is found within the Irvine Spectrum Center -- known for its convenient and professional litigation environment. These accommodations offer an express route of entry from either the 405 or 5 freeways running from Irvine Center Drive and Barranca. The suite is fully equipped. We have a deluxe reception space, professional atmosphere, and fully equipped deposition accommodations. The five deposition suites offer state-of-the-art audio and video technology and seat twelve individuals comfortably. 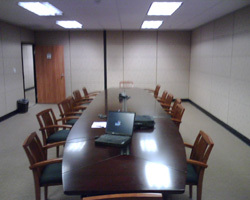 We also provide modern video conferencing.